Katharine Dickerson was born in Duluth Minnesota in 1947. She became a Canadian citizen in 1977. Her Norwegian heritage, on her mother’s side, has become increasingly important in forming her aesthetic values. The time she has shared with the Salish, Maori and Aborigines, learning their textile practices, has firmly established the necessity of passing down Textile traditions in an oral manner. It is the stories that really count and give context to the technical processes. 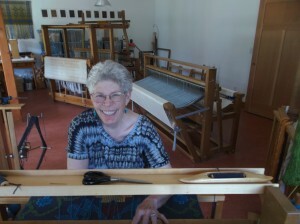 Katharine Dickerson has over 40 years of weaving experience. She also has years of experience working in other Textile processes such as spinning, knitting, garment design and construction, quilting, natural dyeing of fibres as well as various methods of cloth dyeing. She retired from the Alberta College of Art + Design in 2007 after 30 years of teaching. In 2009 she was named “Lecturer Emeritus” by the Board of Governors of the Alberta College of Art + Design. Katharine’s education was in both fine arts and weaving. She believes that when both technical skills and creative inspiration are balance the resulting Textile establishes a unique place in building the future Textile tradition. Please visit Katharine’s resume or portfolio for a listing of her many professional accomplishments.